The TicWatch S2 is one of the best affordable Wear OS watches you can buy. While it is missing a few features some will consider core to a smartwatch experience, such as NFC for Google Pay, there's a lot to love about Mobvoi's device. Chances are you won't have heard of Mobvoi before, despite the brand having made some of our favorite smartwatches of the last few years. This is the company behind one of our top smartwatches, the TicWatch Pro, as well as the TicWatch C2, TicWatch E and TicWatch S, and its latest wearable is the TicWatch S2, the follow-up to the final watch on that list. The TicWatch S2 – the S stands for 'sport' – is one of the most affordable Wear OS watches on the market. It was announced alongside the TicWatch E2, which is remarkably similar. In fact, the only differences between the watches is the look and the materials each is made out of. The S2 is a more expensive option than the E2 though, so you may want to consider that before you buy the TicWatch S2. 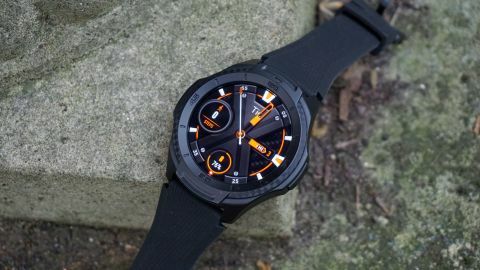 The TicWatch S2 was announced early in 2019, and you can now buy it from the official Mobvoi website. In the UK it's also available from Amazon, and we'd expect that more third-party retailers will start offering the watch in time. This is an affordable smartwatch, with the price set at £165.99 / $179.99 / AU$282.99, which is around £20 / $20 more than the TicWatch E2. That extra cost is because this watch is made of more premium materials than the E2 – we'll dig into that a little more in the design section below. Despite it being more expensive than the E2, it's important to note that the TicWatch S2 is one of the most affordable Wear OS watches you can buy. If cost is an important consideration for you, you'd be hard-pressed to get a better deal for a Wear OS device. If you’ve worn a TicWatch before, you’ll recognize a lot of the design here. It’s not the most premium device on the market, but it’s unlikely you were expecting that if you've just read the section above on price. If you’re after a more premium-feeling smartwatch check out the TicWatch Pro, or our best smartwatch rankings if you want something not designed by Mobvoi. Back to the TicWatch S2, and the first thing we noticed was that this is a comfortable device to wear thanks to its lightweight design. It’s made of polycarbonate, which we found to be light on the wrist. With dimensions of 46.6 x 51.8 x 12.9mm it may be a bit cumbersome for anyone with smaller wrists, as it's a little thick, but it's not weighty at the same time. And if you prefer larger watches, you're likely to appreciate the size of this watch. At launch you’ll only be able to buy the TicWatch S2 in black (pictured throughout this review), but Mobvoi has confirmed that it plans to bring a white version to market in the near future. The strap itself is made of silicone, and it's a 22mm interchangeable design, so you can swap it out for a different one – you couldn't swap straps on the original TicWatch S, so this is a welcome improvement. The silicone strap that's included in the box is comfortable both for day-to-day wear and exercising. The front of the TicWatch S2 features a raised rim around the outside of the display engraved with numbers, like a traditional watch design. We liked the neon look of some TicWatch S models, but that has been dropped here for a more neutral black shade. There's a single button for interacting with the watch, on the right-hand side. It's in the same position as a crown would be on a traditional watch, but the button is less tactile than we'd like, so we sometimes found ourselves pressing it down once or twice before we did it firmly enough to get a response. Pressing it will either wake the watch or bring up the main app menu, and from there on you'll be using the watch's 1.39-inch AMOLED touchscreen to navigate around the other features on the watch. The watch has a bright and clear display with strong viewing angles, so you can easily take a quick peak at the time when you need it. The resolution is 400 x 400, which is about standard for watches of this type and makes for a perfectly good screen image. There's also an always-on feature, which means you won't always need to tap your watch's display to be able to read the time or interact with your music and other apps. We found that to be helpful on the watch and it had quick reaction times, meaning you're never waiting long for the features to kick off. Back to the design of the TicWatch S2, and it's rocking 'military-grade' protection. That's something you don't get on the TicWatch E2, and Mobvoi claims this is the most robust watch yet from the company, so it'll be able to take a beating when you're out on your adventures. Obviously that doesn't mean you can afford to get careless with your TicWatch S2 and bash it about, but it does mean it should be more durable than your average smartwatch when it comes to drops and knocks. The S2 also has a water resistance rating of 5ATM, which means it'll survive in depths up to 50 meters. Unless you're a pretty serious diver that should be more than enough, and it also means you can wander absent-mindedly into the shower and not have to panic when you notice the watch is still on your wrist.